“My daughter came up with it and we thought it’d be funny." camera (Seawright Family) The Seawright family from Whittier, California, celebrated their single daughter in their hilarious Christmas card this year. 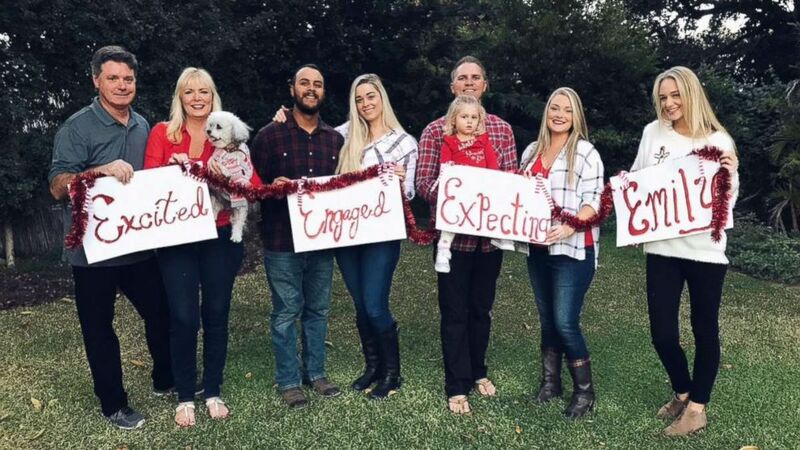 (Seawright Family) The Seawright family from Whittier, California, celebrated their single daughter in their hilarious Christmas card this year. Emily Seawright posted the family photo, taken in their backyard after enjoying their Thanksgiving meal, on Twitter, where it’s gotten nearly 285,000 likes and 46,000 retweets in just two days. Diane Seawright said their immediate family has done crazy Christmas cards for more than 30 years before they had their first daughter. “My husband is in the film industry. He’s a first cameraman so we’ve been a lot of places,” she said of the exotic locations they’ve shot their cards in the past, like South Africa, New Orleans and Lake Arrowhead. But the Christmas card tradition goes back generations to her husband’s grandfather, Roy Seawright, a Hollywood special effects technician. Despite the family getting attention for a card they aren’t the most proud of, Diane Seawright said she’s thrilled to have a memento to mark this exciting time in her family.